We have never been huge fans of canned foods. We decided to take a risk last time we were out at the store. 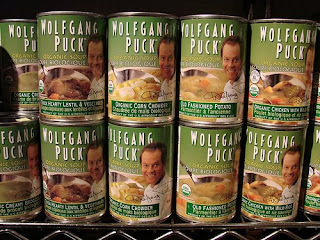 We picked up four cans of Wolfgang Pucks Organic Soup. There are 17 different types of soup to choose from. We popped open a can of the tortilla soup and decided to write about it. It tasted great. Big flavors and all organic ingredients. You can not beat it. The best part is they are not going to put a big dent in your wallet. Check out all the soups here http://www.wolfgangpucksoup.com/my-soups and get some next time your at the store. Enjoy. It may be organic but how much sodium is in the can? I bet it is alot.